Figure 1. Figure 2. Figure 3. Figure 4. Figure A-1. Figure A-2. Figure A-3. Figure A-4. Figure A-5. Figure B-1. Figure B-2. Figure B-3. Figure B-4. Figure Bz5. Figure C-1. Figure C-2. Figure C-3. Figure C-4. Figure C-5. This research was supported by Contract No. 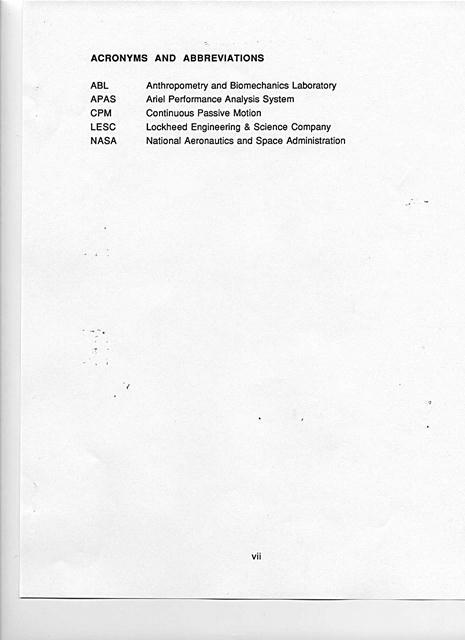 NAS9-17900 from the National Aeronautics and Space Administration, and conducted in the Anthropometry and Biomechanics Laboratory, Johnson Space Center, Houston, Texas. 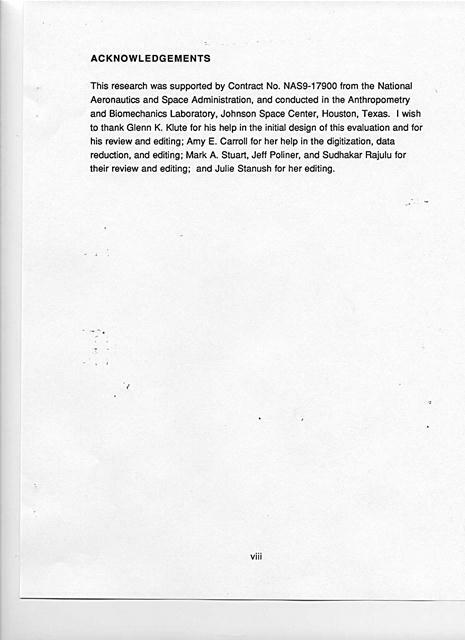 I wish to thank Glenn K. Klute for his help in the initial design of this evaluation and for his review and editing; Amy E. Carroll for her help in the digitization, data reduction, and editing; Mark A. Stuart, Jeff Poliner, and Sudhakar Rajulu for their review and editing; and Julie Stanush for her editing. Kinematics, the study of motion exclusive of the influences of mass and force, is one of the primary methods used for the analysis of human biomechanical systems as well as other types of mechanical systems. The Anthropometry and Biomechanics Laboratory (ABL) in the Crew Interface Analysis section of the Man-Systems Division performs both human body kinematics as well as mechanical system kinematics using the Ariel Performance Analysis System (APAS). The APAS supports both analysis of analog signals (e.g. force plate data collection) as well as digitization and analysis of video data. 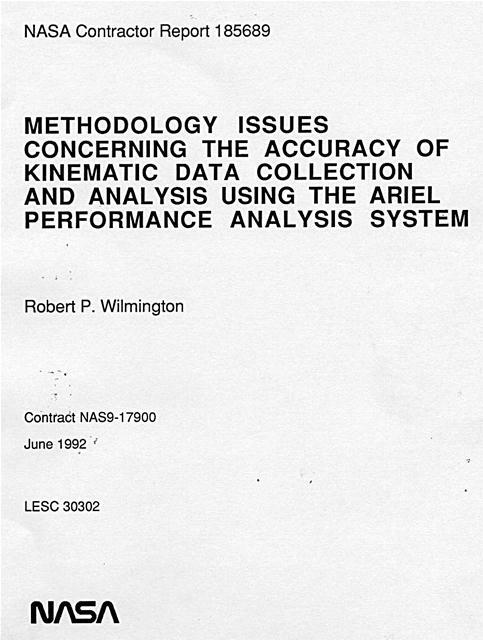 The current evaluations address several methodology issues concerning the accuracy of the kinematic data collection and analysis used in the ABL. 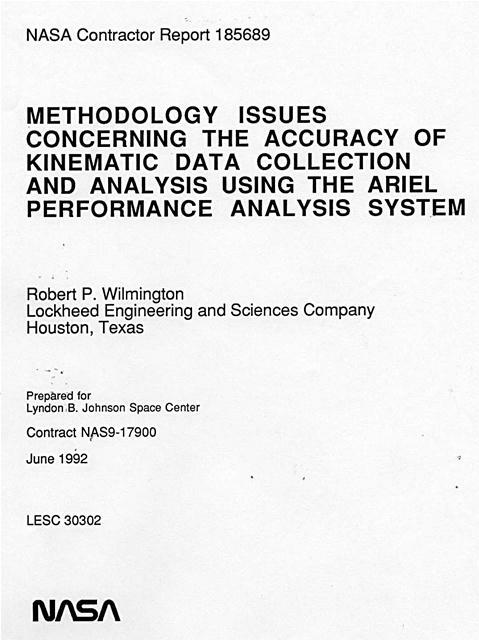 This document describes a series of evaluations performed to gain quantitative data pertaining to position and constant angular velocity movements under several operating conditions. Two-dimensional as well as three-dimensional data collection and analyses were completed in a controlled laboratory environment using typical hardware setups. In addition, an evaluation was performed to evaluate the accuracy impact due to a single axis camera offset. 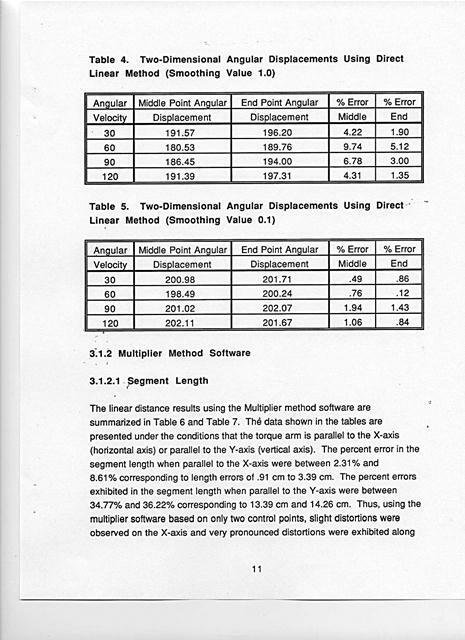 Segment length, positional data, exhibited errors within 3% when using threedimensional analysis and yielded errors within 8% through two-dimensional analysis (Direct Linear Software). 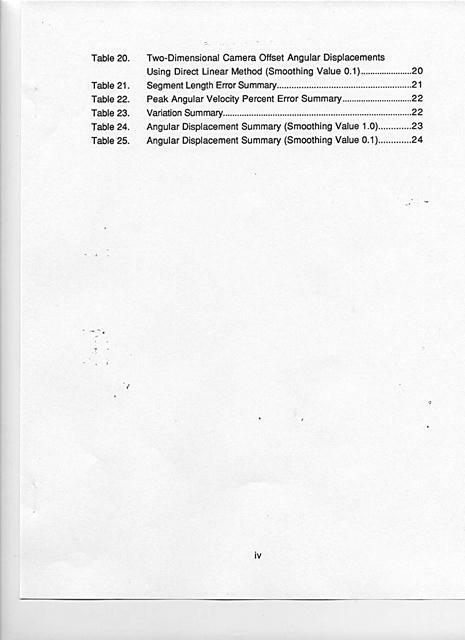 Peak angular velocities displayed errors within 6% through three-dimensional analyses and exhibited errors of 12% when using two-dimensional analysis (Direct Linear Software). 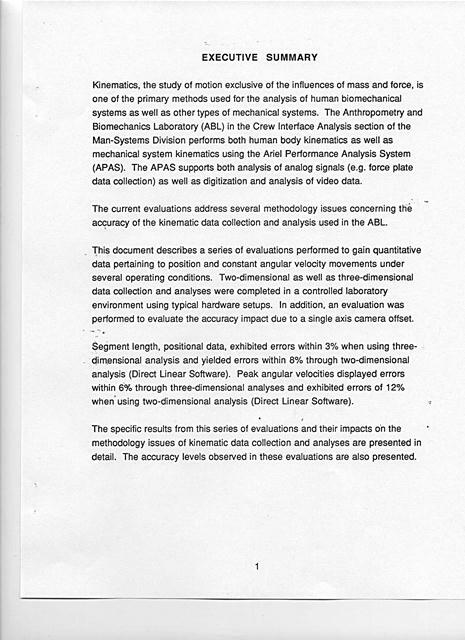 The specific results from this series of evaluations and their impacts on the methodology issues of kinematic data collection and analyses are presented in detail. The accuracy levels observed in these evaluations are also presented. The Anthropometry and Biomechanics Laboratory (ABL) in the Man-Systems Division's Crew Interface Analysis section performs both human body kinematics as well as mechanical system kinematics using the Ariel Performance Analysis System (APAS). Three categories of evaluations have been performed, including: two-dimensional data collection and analysis, threedimensional data collection and analysis, and a two-dimensional single axis camera offset data collection and analysis. This series of evaluations was performed to gain quantitative data pertaining to position and constant angular velocity movements under several operating conditions. Two-dimensional as well as three-dimensional data collection and analyses were completed in a controlled laboratory environment using typical hardware setups. In addition, an evaluation was performed to evaluate the accuracy impact due to a single axis camera offset. Two-dimensional as well as three-dimensional data collection methodologies were addressed. Twodimensional data analysis was performed using two different software packages within the APAS, Direct Linear and Multiplier. Three-dimensional data analysis was performed using the Direct Linear method software. 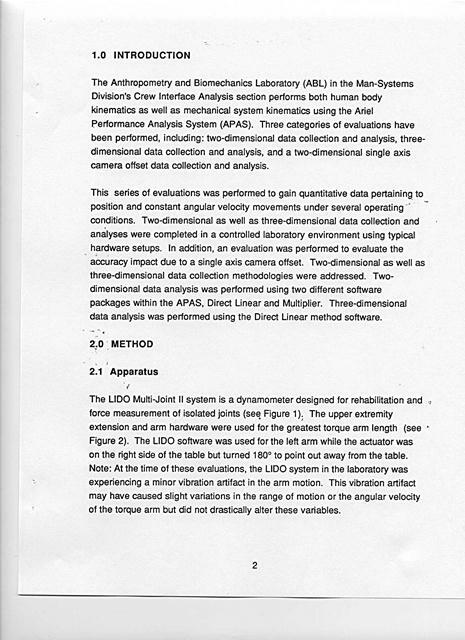 The LIDO Multi-Joint II system is a dynamometer designed for rehabilitation and force measurement of isolated joints (see Figure 1). 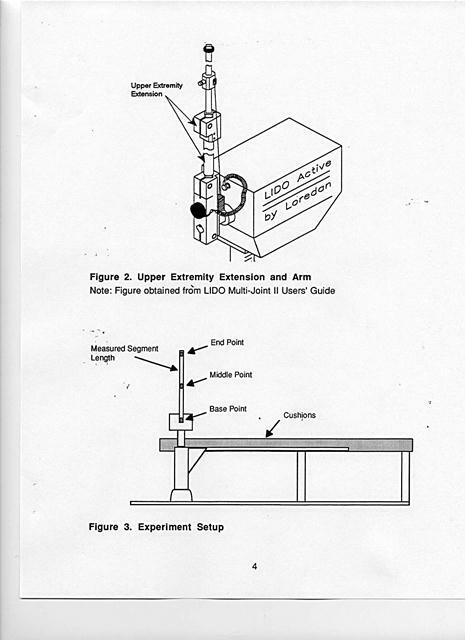 The upper extremity extension and arm hardware were used for the greatest torque arm length (see Figure 2). 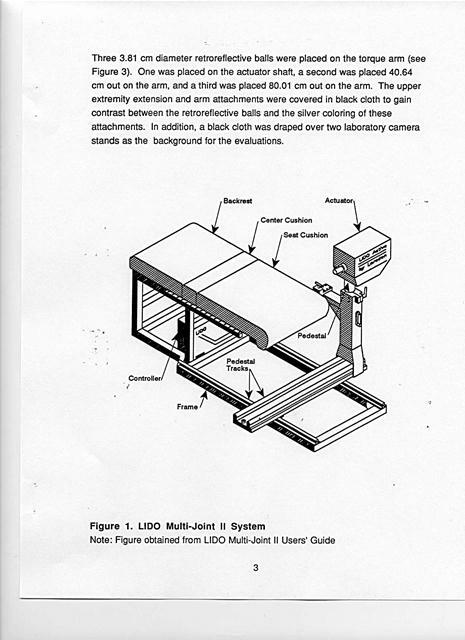 The LIDO software was used for the left arm while the actuator was on the right side of the table but turned 1800 to point out away from the table. Note: At the time of these evaluations, the LIDO system in the laboratory was experiencing a minor vibration artifact in the arm motion. This vibration artifact may have caused slight variations in the range of motion or the angular velocity of the torque arm but did not drastically alter these variables. Three 3.81 cm diameter retroreflective balls were placed on the torque arm (see Figure 3). One was placed on the actuator shaft, a second was placed 40.64 cm out on the arm, and a third was placed 80.01 cm out on the arm. The upper extremity extension and arm attachments were covered in black cloth to gain contrast between the retroreflective balls and the silver coloring of these attachments. In addition, a black cloth was draped over two laboratory camera stands as the background for the evaluations. A Panasonic camcorder (model PV-530) and a Quasar camcorder (model VM37) were used for all the video recordings at a film speed of 30 frames/second. Wide angle lenses (.5X) were used in all of the evaluations. 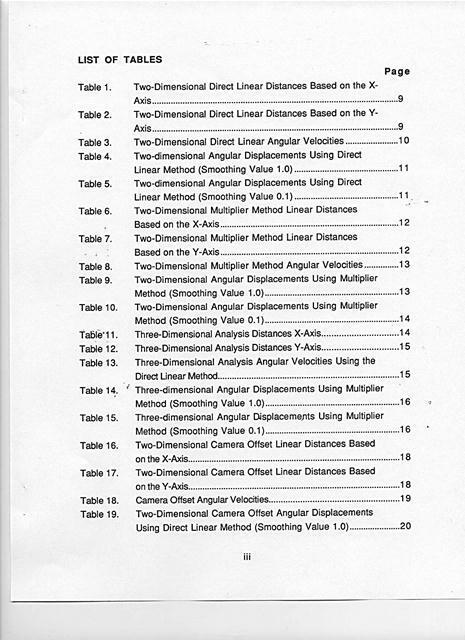 A flash was used for synchronizing the cameras in the three-dimensional analysis. A reference frame constructed of PVC pipe was used in the evaluations. The frame has a 91.44X91.44 cm base and a height of 183 cm. The calibration reference frame has markings on the four vertical struts every 45.7 cm. 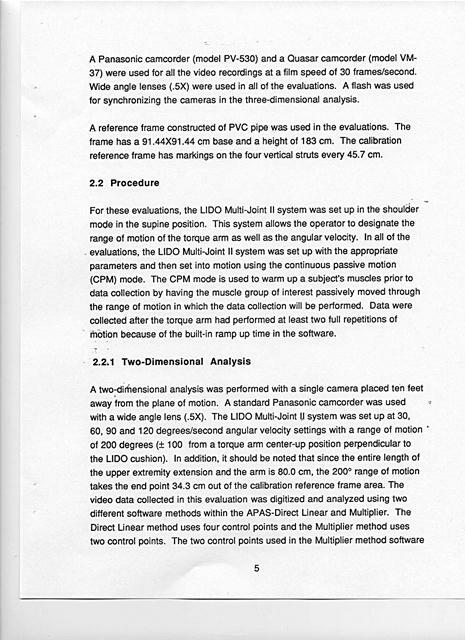 For these evaluations, the LIDO Multi-Joint II system was set up in the shoulder mode in the supine position. This system allows the operator to designate the range of motion of the torque arm as well as the angular velocity. In all of the evaluations, the LIDO Multi-Joint II system was set up with the appropriate parameters and then set into motion using the continuous passive motion (CPM) mode. The CPM mode is used to warm up a subject's muscles prior to data collection by having the muscle group of interest passively moved through the range of motion in which the data collection will be performed. Data were collected after the torque arm had performed at least two full repetitions of motion because of the built-in ramp up time in the software. were placed along the X (horizontal) axis. All data were taken for 10 seconds with a skip factor of 4. The skip factor indicates the number of frames that are intentionally left undigitized for every digitized frame. Thus with the video being recorded at 30 frames/second, a skip factor of 4 correlates to 6 frames/second digitized (frame 1 digitized and frames 2 - 5 skipped, frame 6 digitized and frames 7-10 skipped, etc.). The skip factor is used to reduce the amount of time required in the digitization process. 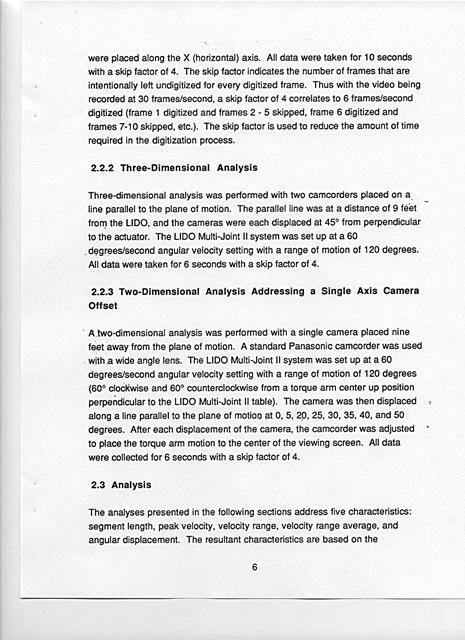 Three-dimensional analysis was performed with two camcorders placed on a_ line parallel to the plane of motion. The parallel line was at a distance of 9 feet from the LIDO, and the cameras were each displaced at 45ï¿½ from perpendicular to the actuator. The LIDO Multi-Joint II system was set up at a 60 degrees/second angular velocity setting with a range of motion of 120 degrees. All data were taken for 6 seconds with a skip factor of 4. A two-dimensional analysis was performed with a single camera placed nine feet away from the plane of motion. A standard Panasonic camcorder was used with a wide angle lens. The LIDO Multi-Joint II system was set up at a 60 degrees/second angular velocity setting with a range of motion of 120 degrees (60ï¿½ clockwise and 60ï¿½ counterclockwise from a torque arm center up position perpendicular to the LIDO Multi-Joint II table). The camera was then displaced along a line parallel to the plane of motion at 0, 5, 20, 25, 30, 35, 40, and 50 degrees. After each displacement of the camera, the camcorder was adjusted to place the torque arm motion to the center of the viewing screen. All data were collected for 6 seconds with a skip factor of 4.
placement of the retroreflective balls on the torque arm. One retroreflective ball was placed on the actuator shaft and is referred to as base point. A second retroreflective ball placed 40.64 cm out on the torque is termed the middle point. 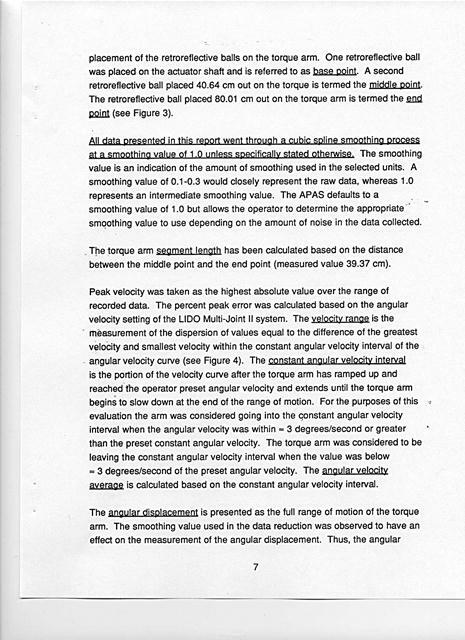 The retroreflective ball placed 80.01 cm out on the torque arm is termed the end point (see Figure 3). All data presented in this report went through a cubic spline smoothing process at a smoothing value of 1.0 unless specifically stated otherwise., The smoothing value is an indication of the amount of smoothing used in the selected units. A smoothing value of 0.1-0.3 would closely represent the raw data, whereas 1.0 represents an intermediate smoothing value. The APAS defaults to a smoothing value of 1.0 but allows the operator to determine the appropriate smoothing value to use depending on the amount of noise in the data collected. The torque arm seament length has been calculated based on the distance between the middle point and the end point (measured value 39.37 cm). 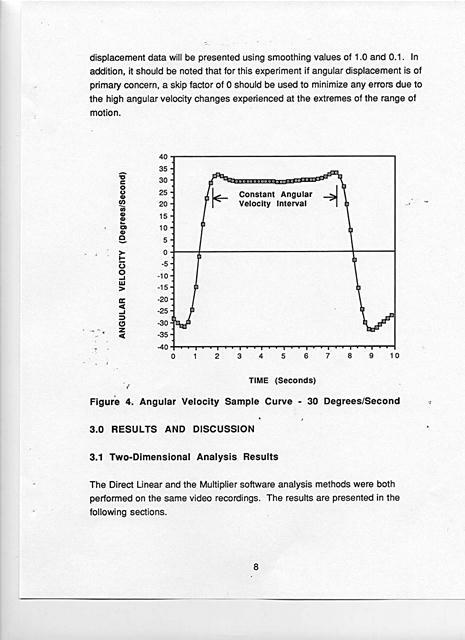 3 degrees/second of the preset angular velocity. The angular velocity average is calculated based on the constant angular velocity interval. displacement data will be presented using smoothing values of 1.0 and 0.1. 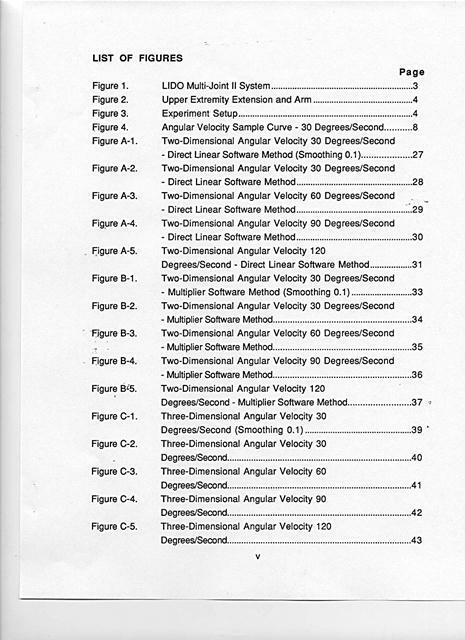 In addition, it should be noted that for this experiment if angular displacement is of primary concern, a skip factor of 0 should be used to minimize any errors due to the high angular velocity changes experienced at the extremes of the range of motion. 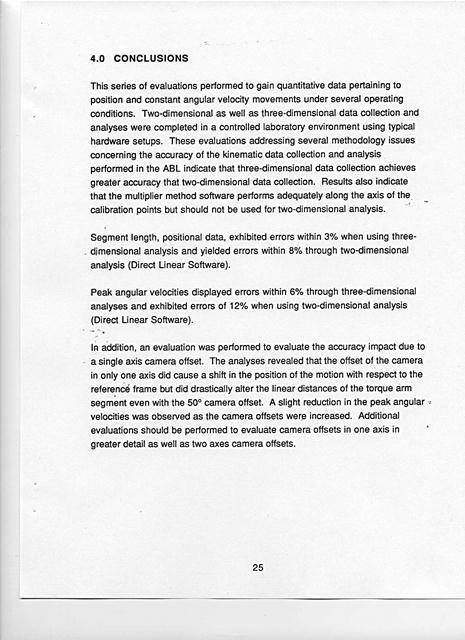 The Direct Linear and the Multiplier software analysis methods were both performed on the same video recordings. The results are presented in the following sections. torque arm at 0ï¿½. The percent error in the segment length as taken when along the X axis was between 2.13% and 7.92% corresponding to segment length errors of .84 cm to 3.12 cm. Segment length percent error as taken when along the Y axis was between 3.87% and 8.74% corresponding to length errors of _ 1.53 cm to 3.44 cm. 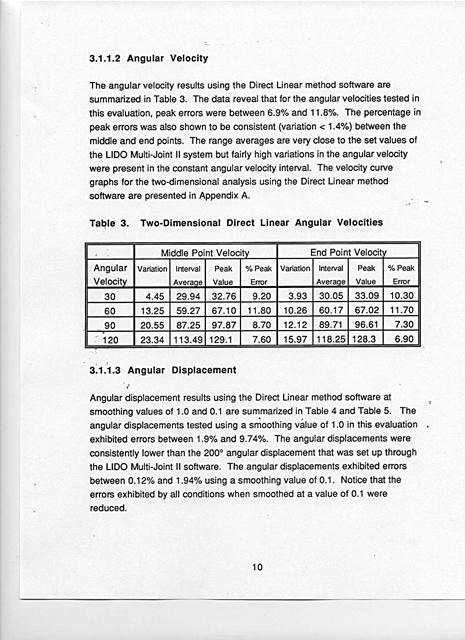 Angular displacement results using the Direct Linear method software at smoothing values of 1.0 and 0.1 are summarized in Table 4 and Table 5. 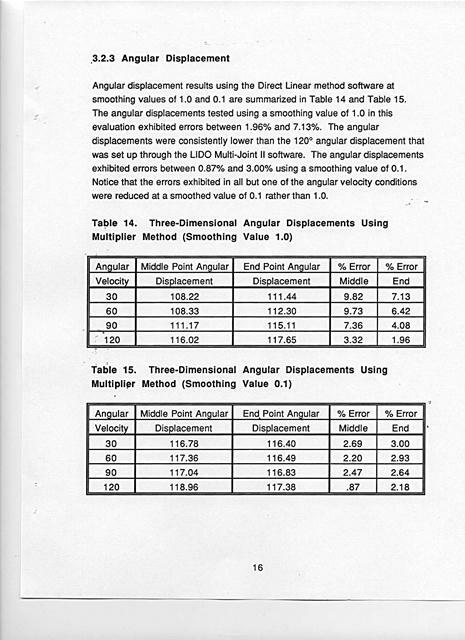 The angular displacements tested using a smoothing value of 1.0 in this evaluation exhibited errors between 1.9% and 9.74%. The angular displacements were consistently lower than the 200ï¿½ angular displacement that was set up through the LIDO Multi-Joint II software. The angular displacements exhibited errors between 0.12% and 1.94% using a smoothing value of 0.1. Notice that the errors exhibited by all conditions when smoothed at a value of 0.1 were reduced. the Y-axis. The two control point locations used in this evaluation were placed along the X-axis. 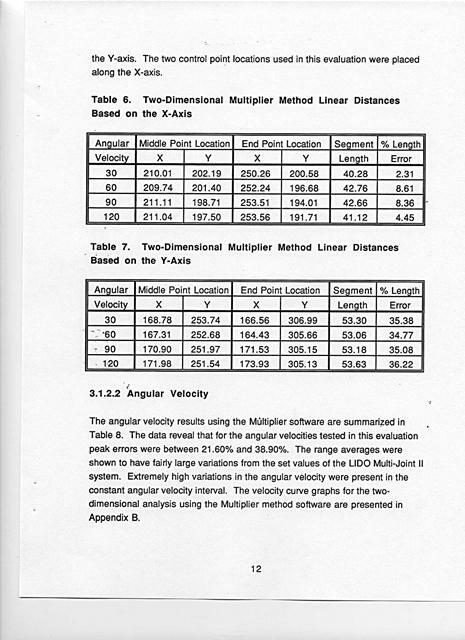 The angular velocity results using the Multiplier software are summarized in Table 8. The data reveal that for the angular velocities tested in this evaluation peak errors were between 21.60% and 38.90%. The range averages were shown to have fairly large variations from the set values of the LIDO Multi-Joint II system. Extremely high variations in the angular velocity were present in the constant angular velocity interval. 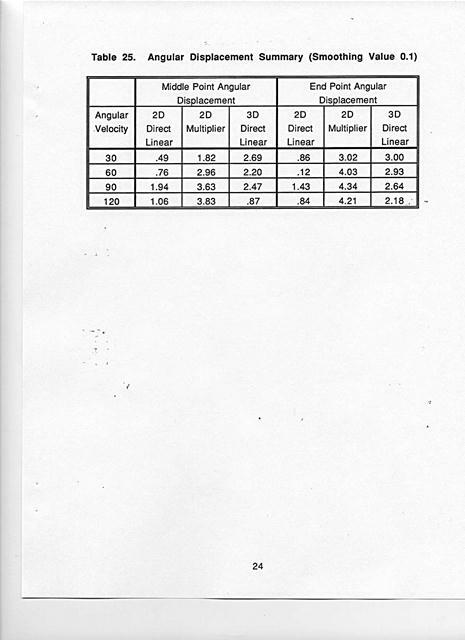 The velocity curve graphs for the twodimensional analysis using the Multiplier method software are presented in Appendix B.
Angular displacement results using the Multiplier method software at smoothing values of 1.0 and 0.1 are summarized in Table 9 and Table 10. It should be noted that both extremes of the range of motion are only 10 degrees beyond being parallel to the X-axis. The angular displacements analyzed at a smoothing value of 1.0 were shown to have errors between 0.3% and 8.51 %. The angular displacement errors for the middle point tended to be much higher than those exhibited for the end point. The angular displacements analyzed at a smoothing value of 0.1 exhibited errors between 1.82% and 4.34%. Notice that the overall magnitude of the error was reduced from 8.51% to 4.34% but several of the individual percent error values were increased. 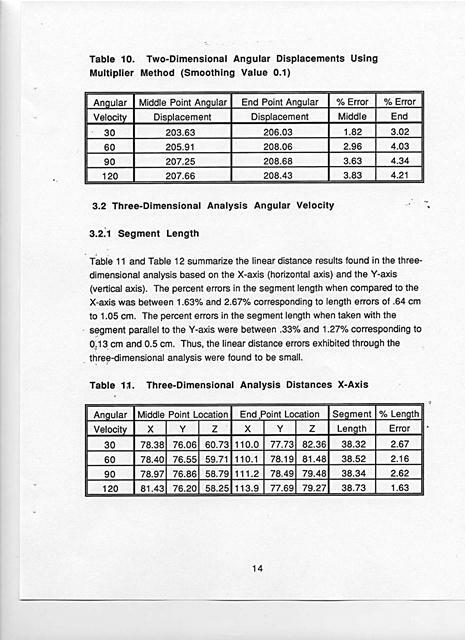 Table 11 and Table 12 summarize the linear distance results found in the threedimensional analysis based on the X-axis (horizontal axis) and the Y-axis (vertical axis). The percent errors in the segment length when compared to the X-axis was between 1.63% and 2.67% corresponding to length errors of .64 cm to 1.05 cm. The percent errors in the segment length when taken with the segment parallel to the Y-axis were between .33% and 1.27% corresponding to 0.13 cm and 0.5 cm. 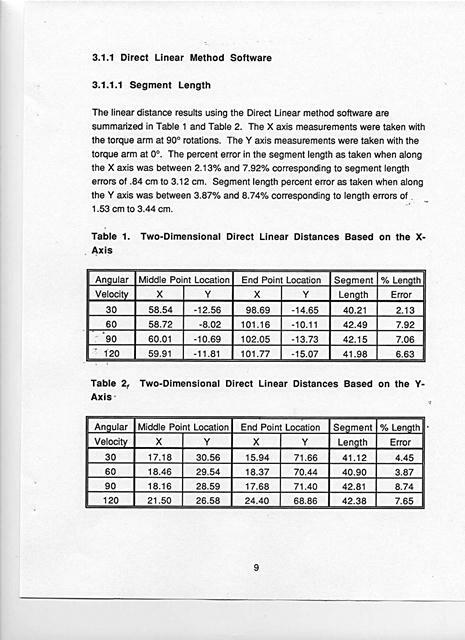 Thus, the linear distance errors exhibited through the three-dimensional analysis were found to be small. 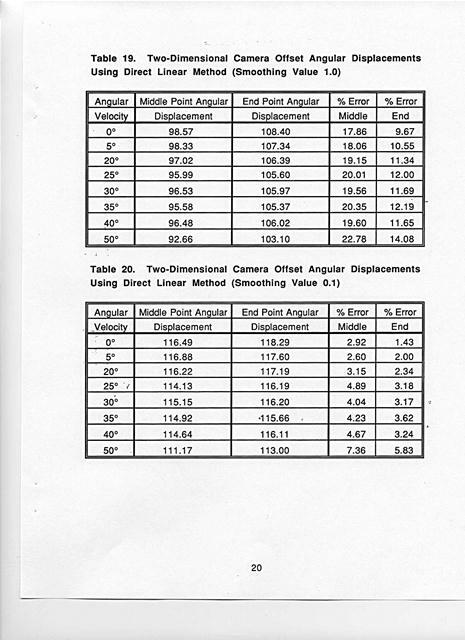 Angular displacement results using the Direct Linear method software at smoothing values of 1.0 and 0.1 are summarized in Table 14 and Table 15. The angular displacements tested using a smoothing value of 1.0 in this evaluation exhibited errors between 1.96% and 7.13%. The angular displacements were consistently lower than the 120ï¿½ angular displacement that was set up through the LIDO Multi-Joint II software. The angular displacements exhibited errors between 0.87% and 3.00% using a smoothing value of 0.1. 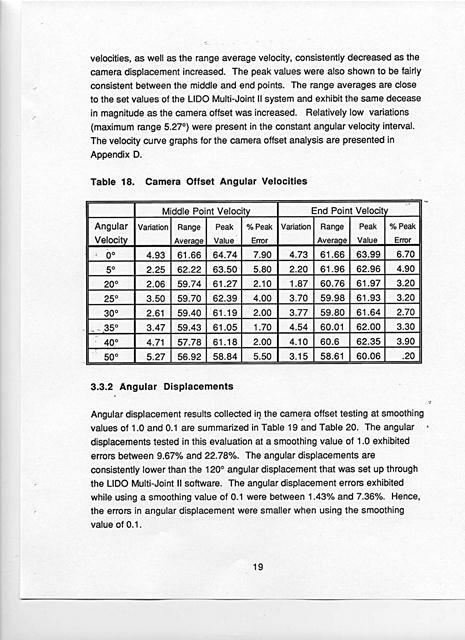 Notice that the errors exhibited in all but one of the angular velocity conditions were reduced at a smoothed value of 0.1 rather than 1.0.
and 60ï¿½ counterclockwise from a torque arm center up position perpendicular to the LIDO table). summarized in Table 16 and Table 17. The data presented in the tables are presented in terms of being closest to parallel to the X-axis (horizontal axis) and parallel to the Y-axis (vertical axis). The percent errors in the segment length when parallel to the X-axis was between 1.10% and 6.38% corresponding to length errors of 0.43 cm to 2.51 cm. The percent errors exhibited in the segment length when parallel to the Y-axis were between 2.92% and 7.92% corresponding to 1.15 cm and 3.12 cm. Raw data taken with respect to the X-axis does reveal that the Y values for the middle and end points are very consistent but the X values are skewed as the camera is offset. In a similar manner, when comparing data with respect to the Y-axis, the Y values are again very consistent while the X values are skewed with the camera offset. One should note that the offset of the camera was performdd only in the X direction. A skewing effect along the axis of the camera offset was observed but did not skew the Y-axis. Thus, although an absolute shift in raw data was observed along the X-axis, it does not appear to drastically alter the relative distances between the two points over this range of motion. 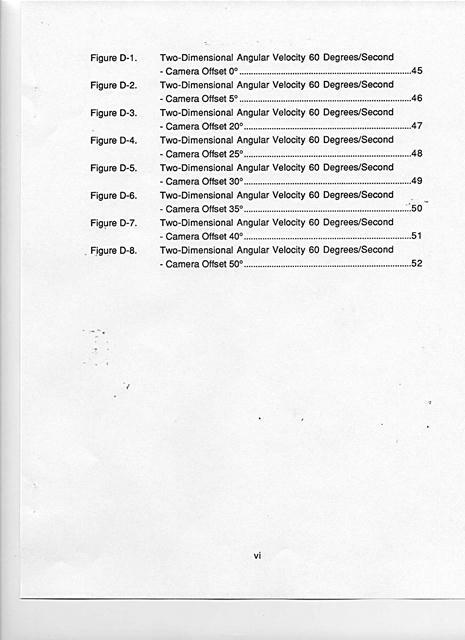 velocities, as well as the range average velocity, consistently decreased as the camera displacement increased. The peak values were also shown to be fairly consistent between the middle and end points. The range averages are close to the set values of the LIDO Multi-Joint II system and exhibit the same decease in magnitude as the camera offset was increased. Relatively low variations (maximum range 5.27ï¿½) were present in the constant angular velocity interval. 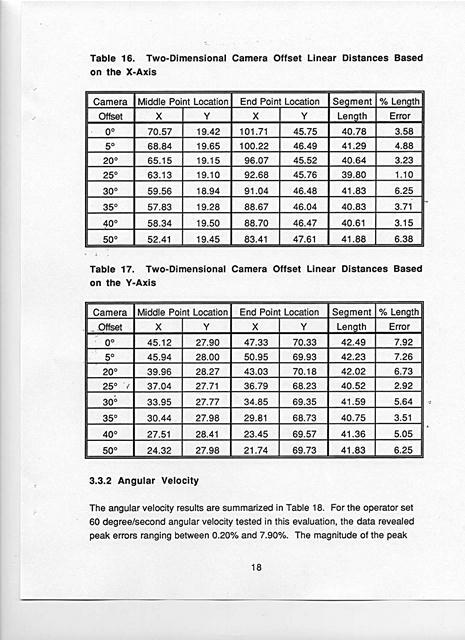 The velocity curve graphs for the camera offset analysis are presented in Appendix D.
Angular displacement results collected in the camera offset testing at smoothing values of 1.0 and 0.1 are summarized in Table 19 and Table 20. The angular displacements tested in this evaluation at a smoothing value of 1.0 exhibited errors between 9.67% and 22.78%. The angular displacements are consistently lower than the 120ï¿½ angular displacement that was set up through the LIDO Multi-Joint II software. The angular displacement errors exhibited while using a smoothing value of 0.1 were between 1.43% and 7.36%. 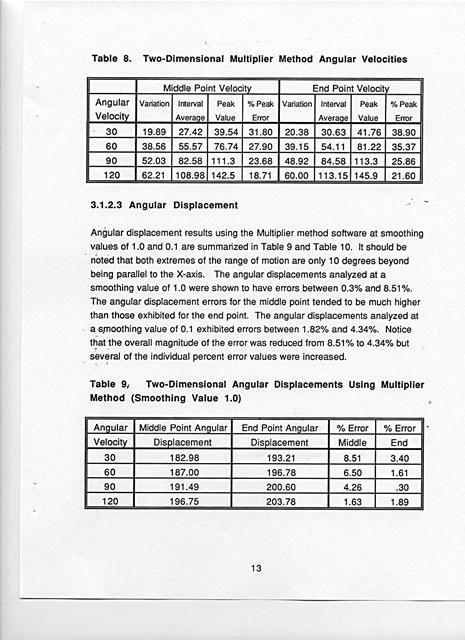 Hence, the errors in angular displacement were smaller when using the smoothing value of 0.1. A summary of the segment length results found in two-dimensional and threedimensional analyses is presented in Table 21. The results using the direct linear method software indicate that the worst error exhibited in twodimensional analysis was 8.74% while the worst error shown through threedimensional analysis was 2.67%. The two-dimensional Multiplier method displayed errors only slightly larger than the two-dimensional Direct Linear method when taken with respect to the X axis, but exhibited large errors with respect to the Y-axis. The Multiplier method had a maximum segment length error of 36.22% with respect to the Y-axis. 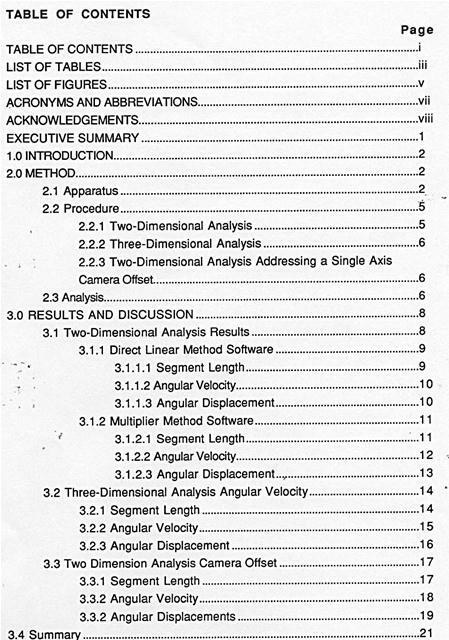 Angular velocity results from the two-dimensional and three-dimensional analyses are presented in Table 22 and Table 23. 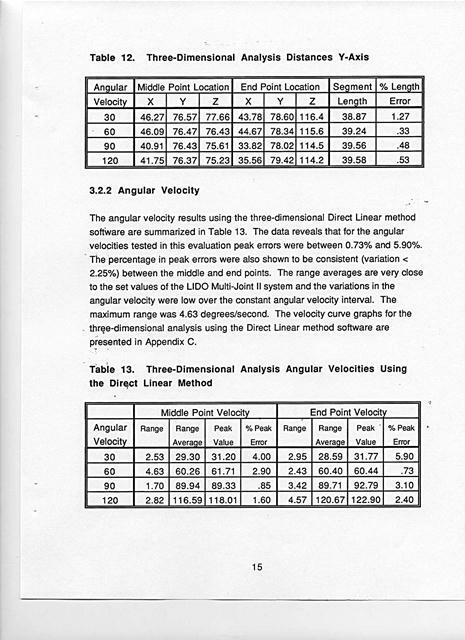 The peak angular velocity results using the direct linear method software indicate that the worst error exhibited in two-dimensional analysis was 11.80% and the worst error shown through three-dimensional analysis was 5.90%. The variation of the data was also much higher in the two-dimensional analysis as compared to the threedimensional analysis. The two-dimensional Multiplier method displayed peak angular velocity errors significantly higher than those observed in either condition using the Direct Linear method software. The Multiplier method had a maximum error of 38.90% and exhibited approximately two to five times greater variation than that observed using the Direct Linear method software. Results from the angular displacement analyses of both two-dimensional and three-dimensional data are presented in Table 24 and Table 25. 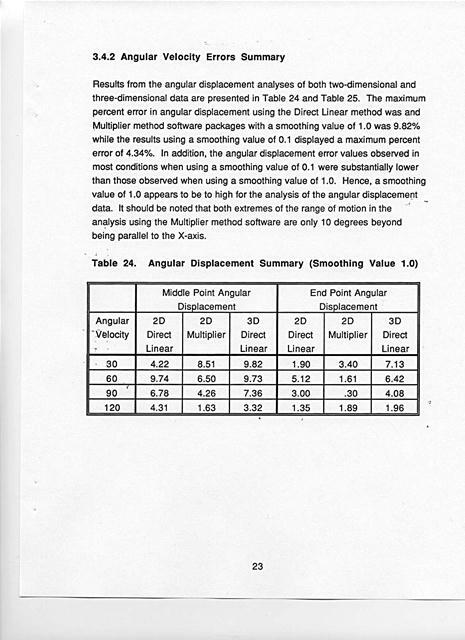 The maximum percent error in angular displacement using the Direct Linear method was and Multiplier method software packages with a smoothing value of 1.0 was 9.82% while the results using a smoothing value of 0.1 displayed a maximum percent error of 4.34%. In addition, the angular displacement error values observed in most conditions when using a smoothing value of 0.1 were substantially lower than those observed when using a smoothing value of 1.0. Hence, a smoothing value of 1.0 appears to be to high for the analysis of the angular displacement data. It should be noted that both extremes of the range of motion in the analysis using the Multiplier method software are only 10 degrees beyond being parallel to the X-axis. This series of evaluations performed to gain quantitative data pertaining to position and constant angular velocity movements under several operating conditions. Two-dimensional as well as three-dimensional data collection and analyses were completed in a controlled laboratory environment using typical hardware setups. These evaluations addressing several methodology issues concerning the accuracy of the kinematic data collection and analysis performed in the ABL indicate that three-dimensional data collection achieves greater accuracy that two-dimensional data collection. Results also indicate that the multiplier method software performs adequately along the axis of the. calibration points but should not be used for two-dimensional analysis. 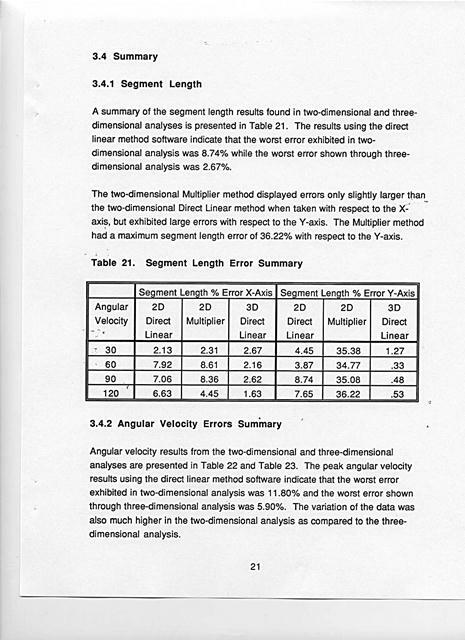 Segment length, positional data, exhibited errors within 3% when using threedimensional analysis and yielded errors within 8% through two-dimensional analysis (Direct Linear Software). 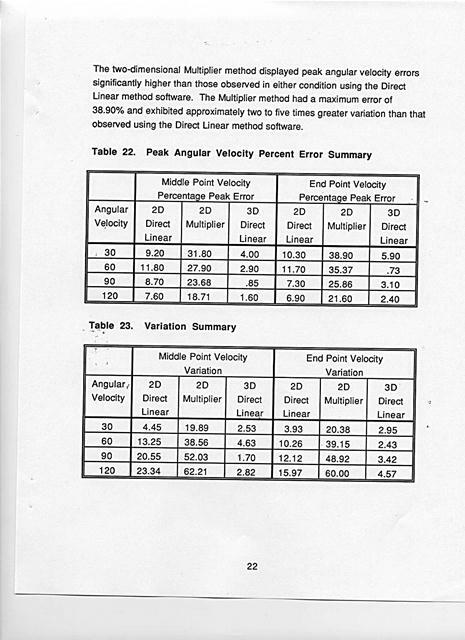 Peak angular velocities displayed errors within 6% through three-dimensional analyses and exhibited errors of 12% when using two-dimensional analysis (Direct Linear Software). In addition, an evaluation was performed to evaluate the accuracy impact due to a single axis camera offset. 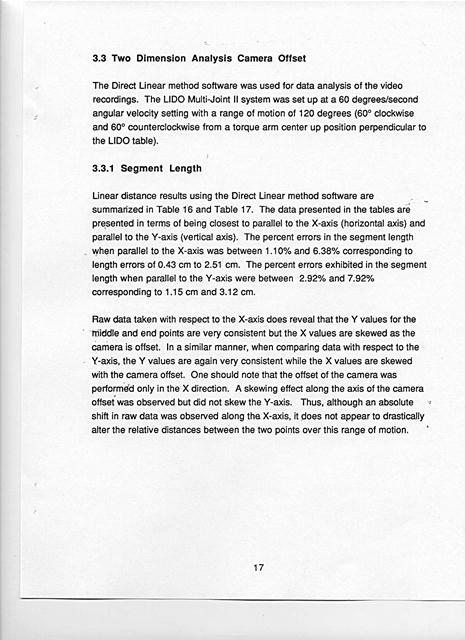 The analyses revealed that the offset of the camera in only one axis did cause a shift in the position of the motion with respect to the referenc6 frame but did drastically alter the linear distances of the torque arm segment even with the 500 camera offset. A slight reduction in the peak angular velocities was observed as the camera offsets were increased. Additional evaluations should be performed to evaluate camera offsets in one axis in greater detail as well as two axes camera offsets. Generated on 4/22/2019 11:05:46 AM (PST) ADI/HQ/GBA/2019/ARIELCLOUD/v3.0.2018.0126.